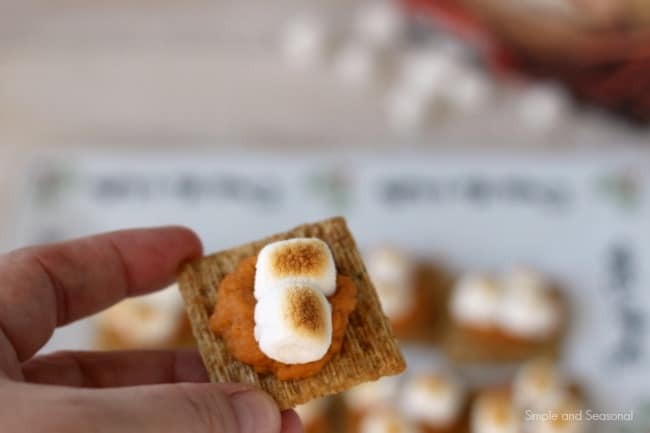 Capture the flavors of the season in these easy Sweet Potato Bites featuring Nutmeg and Cinnamon Triscuit Crackers! One of my favorite things about the holiday season is all the parties! They are basically an excuse to eat yummy food. 🙂 And my favorite party food is appetizers. I love appetizers! Hot dips, breads, cheeses, crackers-bite sized treats of any kind are the best. 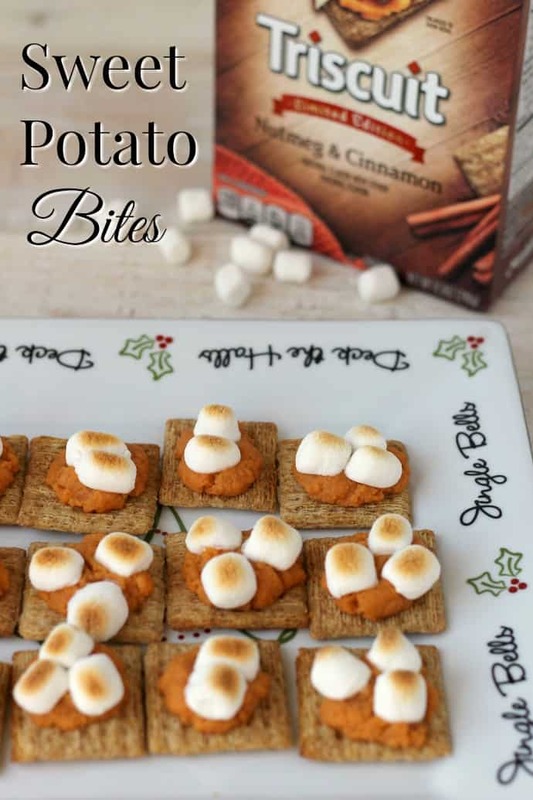 I was inspired to make these Sweet Potato Bites when I saw the newest flavor of Triscuit crackers: Nutmeg & Cinnamon. 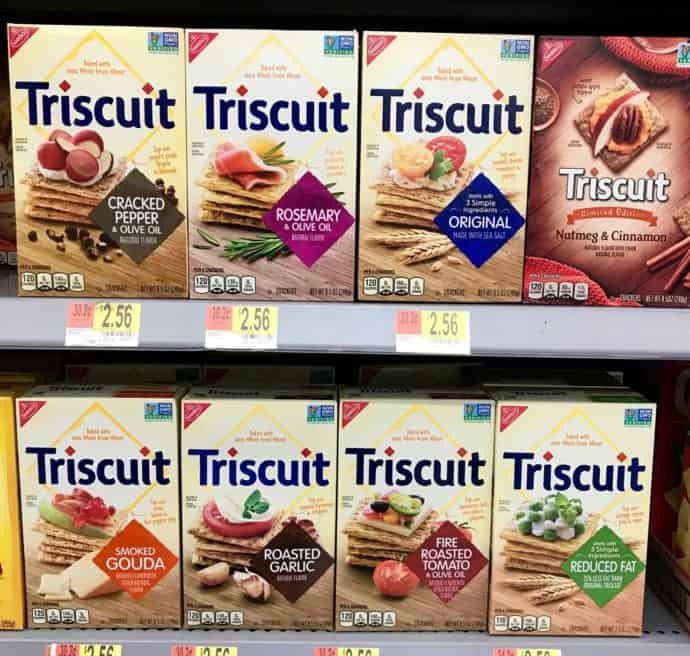 This is such a quick and simple recipe, and the subtly sweet flavor of the Nutmeg & Cinnamon Triscuit crackers is perfect for it. To make it even easier, I used canned sweet potatoes, but you could certainly roast your own fresh sweet potatoes and mash them up. 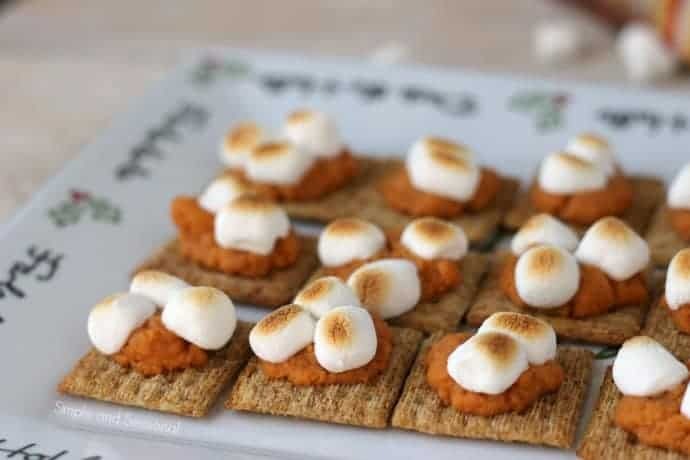 Because of the already sweet flavors in the crackers as well as the marshmallows, I didn’t add any sugar to the sweet potatoes. Simply mash them up with a little butter, salt and pepper and you’re ready to go! You can also press a pecan half into the top of the broiled marshmallows while they are still soft. My kids aren’t really fans of nuts, so I decided to skip them, but I do like the combination of sweet potatoes and pecans, so give it a try! I picked up everything I needed at Walmart . The Smoked Gouda flavor almost had me changing my recipe at the last second, but Nutmeg & Cinnamon was just calling to me. Maybe I’ll try another flavor with my popular Warm Swiss Sweet Onion Dip! Scroll all the way down to enter to win one of 6 $50 gift cards to Walmart! In a saucepan, simmer the sweet potatoes with butter and salt and pepper for 5 minutes. Drain off excess liquid. Mash up the potatoes and allow to cool. Add to a piping bag for easy construction. Place a dozen Triscuit crackers on a baking pan. 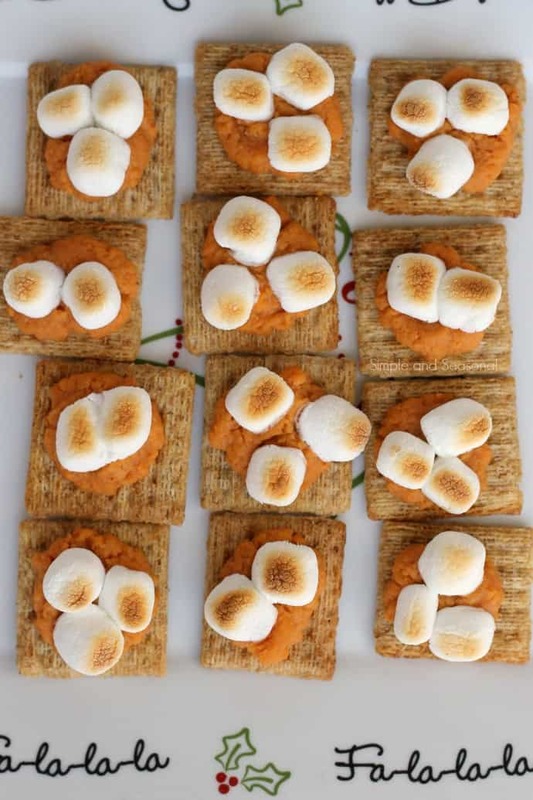 Pipe about 1 tbsp of sweet potato mash onto each cracker. 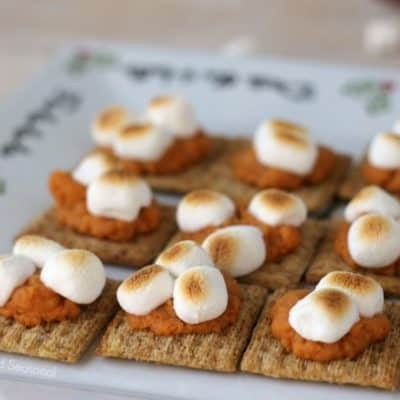 Top with 2-3 mini marshmallows and broil for 1-2 minutes until golden brown. You can also use a mini blow torch to roast the marshmallows. Repeat until ingredients are used up. You should get at least 3 dozen bites, depending on how much topping is added to each one. Quick, easy and perfect for a Christmas party-what more could you ask for? 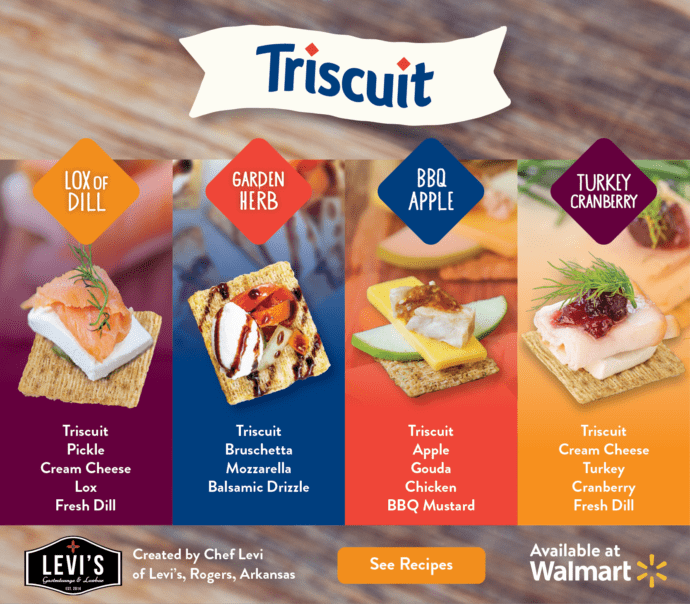 OK, if you’re still looking for yummy Triscuit topping ideas, check these out! They are baked with 100% Whole Grain Wheat and now NON GMO so you know they are a good choice for your family! Don’t forget to enter in the $50 gift card giveaway! I-C will randomly select seven winners from all program entries and will facilitate fulfillment of the winning prizes.